The Spanish commander at Burgos, Conde de Belveder, was an inexperienced and rash officer. He moved out of the strong defenses of Burgos to a weak defensive position in an open plain well in front of the village of Gamonal. Soult arrived with his advance guard at Gamonal on the 10th. 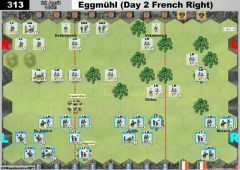 Seeing the enemy’s weak position, he immediately launched his cavalry against the Spanish right, while his infantry used the cover of the woods to advance against the Spanish center and left. Milhaud’s French cavalry drove off the Spanish horse and then proceeded to roll up the Spanish line. Belveder’s attempts to rally his forces were in vain, and the Spanish army broke and fled. Gamonal was the opening action, and the first French victory, in Napoleon’s second invasion and drive on Madrid in November, 1808. • The Pico River is fordable. In Charles Oman's, "Peninsular War Vol I", he describes this action as, "The Rout of Gamonal". And that's exactly what I expected after looking at the scenario details, reading the thread on the forum, and such. Of course, with two relative novices getting together anything can happen, but I still expected a 2-6 defeat as the Spanish ... at best. 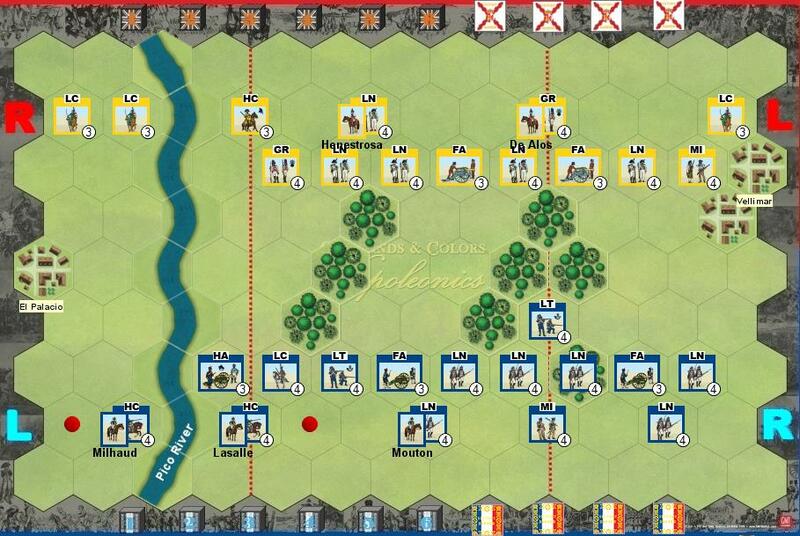 First off, the cavalry on the Spanish left looks in a hopeless position. In hindsight, I should have had them disappear across the Pico and hide behind that line, thus denying the French heavies the chance of breakthrough. But after that, what to do? 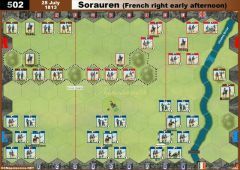 I also hoped to get one or two more guerilla counters through playing scout cards and then try and generate a triple whammy against the French and at least score two or three banners by catching him off guard. I never even saw a scout card in the game, except a late one played by my French adversary. 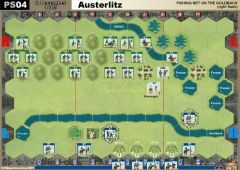 Early on, I failed to extricate my right flank LC's, he played a cavalry charge, and I hesitated to counter with the guerilla token. I'm sure "Bayernkini" who was observing was perplexed at all this. Fortunately, although his HC had five dice again my LC, he rolled nothing - no kills, no flags! - and I lived to fight another day. Immediately, I attacked him, whilst moving my HC unit across to that flank as well. My LC survived MY attacks, and I then played the guerilla counter and went at him again. After a minor "Ahem" moment when Bayernkini reminded us of the French die roll against the guerrilla action, which failed , we attacked again, killing a couple of his units and snagging two banners. 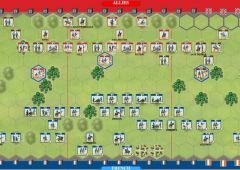 Of course, in the turns immediately afterwards my French opponent took his revenge, but to come out of that cavalry exchange at two banners apiece was like a mini victory. After that, whilst the French began to slowly move his cavalry across from that flank, and move his HA up, I had to take things into my own hands before the inevitable slaughter could happen. Having two bayonet charge cards in my hand, I endeavoured to play them one turn after the other and assault his centre before he was prepared. More lucky dice (three artillery symbols from three dice) killed his centre artillery, and we also managed to knock out a LT and LN. 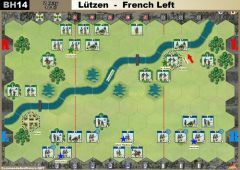 At that point the Spanish were 5-4 to the good, the French had two 1-block infantry units streaming to the rear, and one knockout attack was all that was needed. But back came the French. Quality and weight of numbers in the centre finally told..... plus the fact that at a crucial time I forgot to play a first strike card which might have saved the day (now that is a newbie error!) His HC had my Grenadiers pinned in square whilst his infantry attacked the other supporting units. When the Grenadiers finally succumbed after several rounds of defence in square formation, my French opponent walked away with a 6-5 victory. Far from the rout at Gamonal, Soult was red-faced after this encounter with Belvedere. But a win's a win. We will turn things round and replay the scenario next week. I'm sure both of us will play it much better, but we both agreed we enjoyed the experience despite our tactical mistakes. 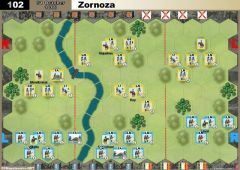 After 3 destroyed Spanish Cavalry units are destroyed, ordered Spanish units may move off the Spanish edge of the battlefield. 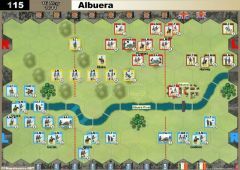 The Spanish player will gain one Victory Banner for each additional ordered Spanish unit that moves off the Spanish edge of the battlefield. 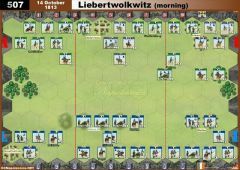 This will incline me to early and aggressive use of the Cavalry to try and take a few banners, and invoke the withdraw condition early. Final i got an idea, to make this scenario more interested and give the spanish a little chance to win. 1.) 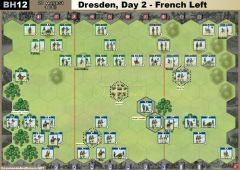 I removed a French HC and LC (from the red doted hexes), without this reduction of the French left flank, the spanish have never a chance. 2.) I added a withdraw Victory Banner rule for the spanish Player. After 3 destroyed spanish Cavalry units, ordered Spanish units may move off the Spanish edge of the battlefield. but their exit may prevent the French player from gaining banners for their elimination if they remain on the battlefield. 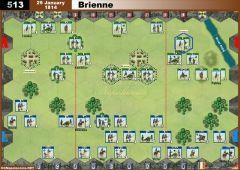 This forces the French to destroy the underrated spanish CAV not to early, withouth a preparation of a final combined attack with his other forces. This rule give the spanish on the other side the time, try to kill also 1-2 French unts before they loose their CAV and together with the Escape VP rule, they have a small victory chance too. and i still don´t see any chance, to rebalance it for spanish. Such scenarios i would not play voluntary, and if, only on the good side (if my opponent want to play it). So what is my experience with all these extrem unbalanced scenarios. Me and a lot of friends/other players simple refuse it to play. I would vote for 2nd option. Another alternate use of the Guerrilla Marker could be a really sabotage action. 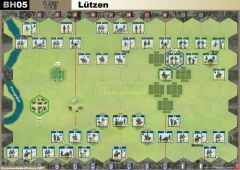 Determine any opponent unit everywhere on the board and roll 4 dice. (similar rule from MM44 - Barrage). I still think that nerfing the French isn't the way to go. Giving the Spanish a leg up towards victory, and generally pushing the French timeframe seems the better option to me. Historically, the Spanish simply appearing on the battlefield was a victory of sorts. The Spanish strategy consisted mainly of keeping armies in being, of maintaining resistance, and attritioning the French. I also detest the Guerilla Marker mechanic, which gets used in ahistorical ways. 3 Guerilla Markers would see the Spanish artillery & Grenadiers Grande Manoeuvre up to point blank, followed by 3 Spanish actions as they cancel French moves. In the game this works, but it never happened historically. So for me, the GM 'breaks' the balance of the IgoUgo system. The guerrilla thing makes the SP feel different, so I have a love/hate relationship with it. I'm wondering if the SP just don't have enough of them for this scenario. In terms of the cards, reducing FR to 4 does take the power out of their Rally, Elan, Assault cards to some extent, but you may be right that its not enough. Combining 4 cards with giving 2 guerrilla markers? Speaking of guerrilla markers...I often wondered if an alternate mechanic where play of a marker could be used instead to allow the SP player to make a 4 dice attack immediately (alter by terrain)on a unit as it enters a square (fire as if by ranged and the usual roll from FR player to attempt to avoid by rolling a xsd). This would represent the behind the scenes ambush tactics. Whilst reducing the Command cards might seem an option, this playing showed that 6 Command cards can be just as bad as 4 Command cards. French hand was 4 Probes and 2 Scouts at one stage. 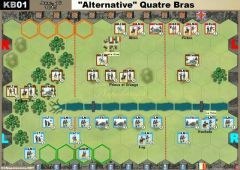 The winning card was a Counter attack of the Spanish play of Assault Centre. So I think the Spanish need to be helped, rather than the French hindered. My view is that the Guerilla Marker mechanic should be changed, such that each Guerilla Marker is played at the start of any Spanish turn for a banner. This gives the Spanish a better chance to win, and puts time pressure on the French. I'd give the Spanish a 2 banner head start, plus the modified GM mechanic to make the French work. First time playing this one. Spanish, I think, played as well as they could. Still a not too difficult win for the FR. I will only play this scenario again, if the FR are reduced to 4 cards. Its really the only way to come close to giving SP a chance...as reflected by the 93% FR wins. I cant help but wonder who the heck playtests such unbalanced scenarios? so i would test it with only 5 or 4 command cards on french side. so should the Spanish start with 2-3 Banners in thisone just to balance it up? Hard to see what other balancing options there are here. Michael draws better cards than me!! With a pretty straight up hand on Assault, Attack & Probe spread over 3 sections, the French won 6-2, but it seemed less than certain throughout the game, and the Spanish dice were quite cold. Spanish could win this on occasion I think. Played just first time Gamonal. Then following a Mounted Charge and later a Bayonette Charge.